: Guardian for flocks and an excellent watchdog. : RKC & SKC, revised by Jennifer Mulholland. : It is a natural breed with its origin in the Carpathian Mountains (Romania and Serbia) and the South of Danube (some regions of Bulgaria). 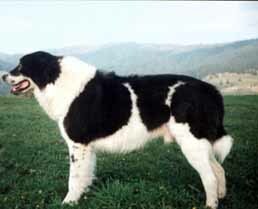 Special attention for the development of the breed arose in the regions of northeastern Romania, the county of Bucovina as well as in the South of the Danube (Serbia) the well-known transhumance areas of the shepherds since immemorial times. Selection and improvement have lead to the actual type. The breed is successfully used both for defending the flocks and herds and as watchdogs for households in the mentioned regions. : Large sized dog; commanding, haughty and proud. The breed has an obvious sexual dimorphism. : The length of the body is slightly superior to the height at the withers. The length of the skull is equal to the length of the muzzle. : Balanced, calm and loyal, he likes children. It is a very good guardian for flocks, courageous and a real fighter against the possible animals of prey (bear, wolf, and lynx). It has a strong bark. When strangers or animals approach, its barking is very strong, with a low tonality. During the night, it patrols around the household or the flock/herd. : Massive but not heavy, slightly higher than the topline. : Moderately wide, slightly domed. The upper profile of the skull and muzzle are slightly divergent. Viewed from the front, the skull is slightly domed, seen from the side it is almost flat. Skull width males 16-18 cm, females 15-17 cm, zygomatic arches are moderately developed. Occipital protuberance is slightly evident. : Large, well developed, black. : Blunt, of the same length as the skull; well developed, narrowing progressively towards the nose but never pointed; strong mandible. : Thick and tight, strong pigmentation. : Strong jaws; complete dentition, strong, healthy and white teeth, well set; scissor bite. Pincer bite is tolerated. : Small related to the head; almond-shaped and obliquely, brown or slightly light but never yellow. Eyelids well pigmented. : Relatively high set, “V” shaped with slightly rounded tip, pendent and carried close to cheeks. Cropping is prohibited. : Medium length, large and strong, without dewlap. : Muscular and moderately inclined towards base of tail. : Broad and deep, descending to elbows, well sprung ribs. : High set-on. At rest, it is pendent; reaching to or lower than the hock; when the dog is alert or in action the tail is raised up to the level of the back or slightly above it, with slight upward curve, but never curled over the back. Docking is prohibited. : Long, oblique, well muscled and firmly attached to the body. Scapular-humeral angle approximately 100-110°. : Close to the body, free movement. : Strong, not too long. : Oval, compact and massive, toes tight and arched, black or ashen nails. : Oval, compact and strong, with black or ashen nails. : Muscular and strong, normal in stance. : Medium long, wide, very muscular. : Femoral-tibia angle is aprox. 110°. : Wide, viewed from the side, moderate angulation. Seen from behind, parallel to median plane of body. : Strong and upright. The presence of dewclaws should not be penalized. : Harmonious, elastic, well coordinated, giving the impression of effortless power. Preferred gait is the trot. Crossover will be penalized. : Thick, close fitting, dark-ashen pigmentation. : Head and the front part of the legs are covered with short hair. On the body, hair is abundant, long (6-9 cm), flat, straight and rough. Undercoat is shorter, very dense and supple, and of a lighter colour. At the neck region, hair is much longer forming a mane; on the backside of the forequarters, the hair forms fringes; on the backside of hindquarters, the hair is longer and forms culottes. The tail is bushy. Main colour of coat is a clear white or white-beige with distinct patches of grey, black or black with red-fawn reflections. Black or grey ticks can appear on the legs. Brindle aspect of patches to be rejected. Solid coloured subjects (without patches) are accepted but not encouraged white, white-beige, ashen-grey or black. Lack of substance or too heavy. Absence of 1 tooth other than P1. Faulty hair or short hair (under 6 cm). Hair too long (over 9 cm). The absence of mane, or fringes on the legs. Flabby toes, toeing in or out. Top line sagging or dipping. Curly coat or bad texture. Different colour of eyes (heterochromatic). Absence of incisors or canines. Naturally absent or atrophic tail. Height under 64 cm or over 82 cm (for males). Height under 60 cm or over 78 cm (for females).